The word ENTITLEMENT gets bandied about rather often… those to the right on the political spectrum say it with a sneer, feminists lament its patriarchal presence, millennials & Gen Z-ers are accused of having enough to spare, and Boomers loathe welfare queens as they collect their social security. It’s a slur, an accusation, and a concept with many faces. But the iteration of entitlement that seems to transcend all demographics is that of the American who has been endowed and enfranchised and enabled with an overblown sense of importance vis-à-vis the democratic process. Entitlement lives just south of gratitude—the awareness a person has to appreciate this, that, and the other—and it’s easy to see how many (if not most) Americans take for granted what it means to have the right to vote, to participate in one’s government. It should be revered, not as a guaranteed blessing of the fair fortune of being born an American but as a sacred duty to perform with utmost care. And that got lost somewhere along the way. How many times have you thought you deserved something only to have it evade you? You can’t always get what you want (and you *know* I just sang that à la The Rolling Stones). You can’t expect. You have to ENSURE. And the same applies in a democracy. 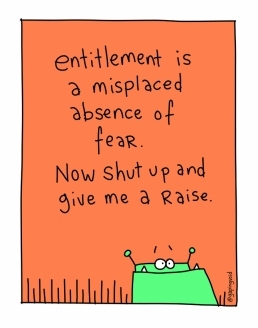 We aren’t entitled to it (more like LUCKY). We don’t always get what we want from it. And, if you want to make something happen, you better get the support for it. And if you vote for something, you should make sure you know what you’re signing up for… recent tax cuts ring a bell? And the perception of what it means to “win”… shoo… the misconception of being automatically entitled to damn-near authoritarian rule once election results come in gives people mental license to walk all over others. Similar to the way Why we choose our leaders says a lot about us, How we treat our vote says even more. ‘A Majority of Outsiders’ sparked great personal convo & the school version got good reviews from a professor I really respect. I’m happy! Oh, is it #wcw already?? @jeljelaine and her amazing expressions take my top spot once again!